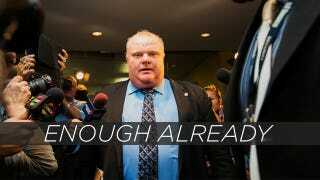 Rob Ford, CitiBike, Bay Area tech woes, China's crippling smog: You've seen all the big headlines for cities this year. But here are a few of the urbanism stories that might have flown under your radar. You read about New York City's glitzy new CitiBike system. But you might not know about Barcelona's Bicing, which was named the world's best. Acccording to a 2013 study, Barcelona's Bicing system is the most successful bike share program in the world. It's one of the most-used systems, averaging 10.8 trips per bike and 67.9 trips per resident, and it also has the best coverage, with one bike per every 270 residents, compared to one per 8,336 for CitiBike. One small quirk with the system: Due to Barcelona's topography, the bikes accumulate at the bottom of its hills and must be moved around each night. You read about Toronto mayor Rob Ford's reggae dancing (among many other crack-related diversions). But you might not have heard about San Diego's criminally charged ex-mayor Bob Filner. San Diego's convicted and perhaps more brazenly assholian mayor has been sentenced to home confinement after pleading guilty to forcibly kissing and inappropriately touching three women at official events. He was charged with one false imprisonment felony count, and two battery misdemeanors. Accusations flooded in from 19 women total—you can see a list of stories from those who've come forward—including one woman who said he put her in a headlock. You read plenty about the High Line and its new expansion. But you might not have heard about the BeltLine's four miles of new urban walking and biking trails in Atlanta. One of the most exciting transportation developments in the country is the BeltLine, a 33-mile multi-use path in a reclaimed railroad right of way that will eventually circle around Atlanta. In August, the BeltLine's Southwest Connector Trail opened as one of seven miles of trails connecting nearby neighborhoods to the BeltLine, and the design was revealed for Ponce City Market, a new mixed-use development in a massive former Sears warehouse along the route and the largest adaptive reuse project in the city's history. A nearby streetcar will open in about a year. You read about the devastating flooding in Colorado that killed 8. But you might not have seen India's monsoonal flooding, its worst disaster since the 2004 tsunami. It's estimated that over 5,700 people were killed in the early season flooding of the Ganges in June. Torrential rains flooded the Delhi airport and caused landslides and building collapses, paralyzing roads and transit systems. Hit hardest was the Uttarkashi region, where many people make religious pilgrimages to remote temples. Helicopters were employed to locate 150,000 people who were airlifted to safety. You read about the U.S. having to temporarily close parks after government shutdown. But you might not have read about Moscow getting its first new park in 50 years. Greenspace is a welcome sign of urban revitalization in Moscow, which hasn't had a new park since 1958. Zaryadye Park is being designed by Diller Scofidio + Renfro, the architects of the High Line, and will include four microclimates: tundra, steppe, forest and marsh (we're not quite sure how they're going to do that, but sounds great). The 13-acre site near the Kremlin has been a vacant lot since a hotel (the largest in Europe at the time) was demolished there in 2006. The park's planners hope to use the new public space to increase pedestrian activity in the area. You read about San Francisco's private tech buses and bad urban design. But you didn't read about how Microsoft and Amazon are pitching in for transit projects in Seattle. While the Bay Area struggles with tech companies that are bad neighbors, Seattle's tech giants are working to make the city better. Amazon is famously designing a new headquarters in South Lake Union that's working to improve the local community and building protected bike lanes on nearby 7th Avenue. Up near its Redmond complex, Microsoft has offered to build a bike and pedestrian bridge near a future transit center that will help connect its employees to light rail. You read about Detroit's vacant and abandoned properties. But you likely hadn't heard about St. Louis's campaign to reclaim vacant urban lots. In St. Louis there are over 20,000 vacant lots—so many that in some areas like North St. Louis, an empty lot is actually the dominant land use. Several organizations in the city are working together to turn the empty land into assets. The Sustainable Land Lab competition tapped architects and designers to come up with ways to transform St. Louis's vacant land and gave five winners $5000 seed money to make their ideas happen. This year, the projects were realized, including a chess park, a restaurant, and a solar calendar. Another competition, PXSTL, will turn a vacant lot into a large cultural complex designed by Freecell. These unique public-private partnerships will not only help find "tenants" for vacant lots, but can also work to find resources and volunteers to easily replicate the ideas anywhere in the city. You read about China's soul-crushing smog. But you probably don't know about Ahvaz, Iran, which has the worst air pollution on earth. China gets all the bad press lately but the truth is that the air is consistently worse in for a region in the Middle East that includes Iran, Pakistan, and India. The city of Ahvaz, Iran has by far the most dangerous air on the planet to breathe, according to the WHO, with a staggering 372 parts per million of particles smaller than 10 micrometers, three times as bad as Beijing. The city of 1.2 million in southwestern Iran is surrounded by heavy, unregulated industry and is prone to dust storms. Its residents have the lowest life expectancy in the country.